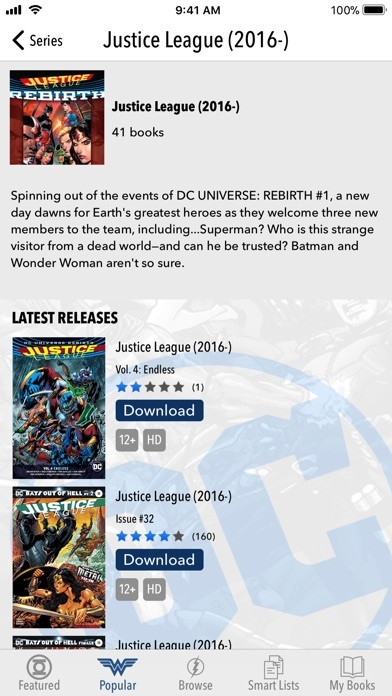 Why doesn’t DC include a search feature? They must have some heavy-handed strategy to increase sales by forcing me to look at the content they choose. It’s insulting. And it’s idiotic marketing. At this moment, for example, I want to buy a specific book. I can’t find it and I need to search. No luck. No sale. Your marketing team doesn’t understand that DC will succeed when they SERVE customers. They’re old school. I strongly advise you to fire them and replace them with people who understand digital. I have been using this app for years haven’t really had any issues until today when I wanted to read some of my older comics, so I downloaded them and went to click to read on them in the series tab it open then closes. The only way for me to read it is go to the book tab and scroll down and find it to read it. I know it’s not a real big issue but it is a little inconvenient. All COMIXOLOGY apps have been ruined by the update: they're all non responsive, no matter what I do. Clearing the cache doesn't work. And no matter how many times I complain, nothing is done about it. I am a DC fan by heart and this is horrible. The pics have horrible resolution compared to Marvels. Blurred lines and foggy resolution i hope they fix this. I grew up in the 60's and love to read the old stuff. I don't know why Superman and Batman 60's stuff is severely lacking issues. The Atom 60's stuff is non existent. One thing about Marvel, so far, I can find their individual 60's issues for everything I've looked for. Plus they always have sales. As a life long dc comics fan, I love being able to have such an extensive collection of comic books but not have them all cluttered in my room. Will rate 5 stars once iPhone X support is added to the app, otherwise it's great! I wish you guys had a better customer service/support feature in your app. The app allows me to read the new issues weekly and catch up on older stories easily without paying collectible print prices. Although I believe there's nothing better than having a physical comic book in your hands to read and collect, the affordability and convenience of this app is a close second. And although your money doesn't go towards supporting a local comic book store, it does go towards supporting DC and the comic book medium. The pricing is fair and the app has little to no glitches. All of this adds together to make this THE app to read D.C. Comic books... literally. Sometimes it can be a bit glitchy but it's usually not a problem and the app is overall great. Also it's cheaper because it's direct to consumer, which means buying more comics and more reading. And also I am currently walking around with over 700 comics in my pocket. That is all. Best app ever! I use it every week! 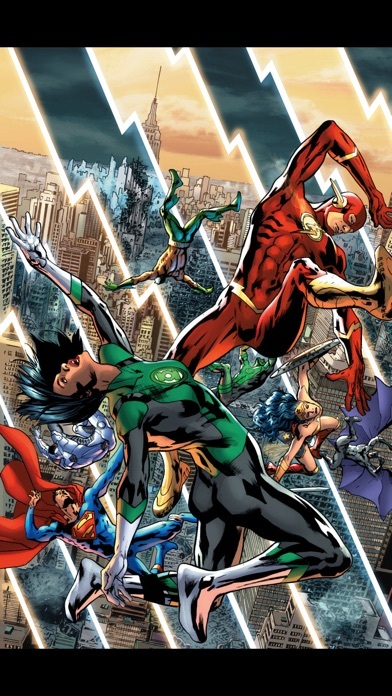 Since DC is, without question, the greatest comic book publisher, it only makes sense that their app is great. It's easy to browse, search, purchase and read books. Terrific app. I've been reading for almost 30 years and when digital came on the scene I thought it couldn't replace actually holding and reading a comic in your hands but I have to say, it's a new experience and this app is just fantastic. It works great on my iPhone and iPad. 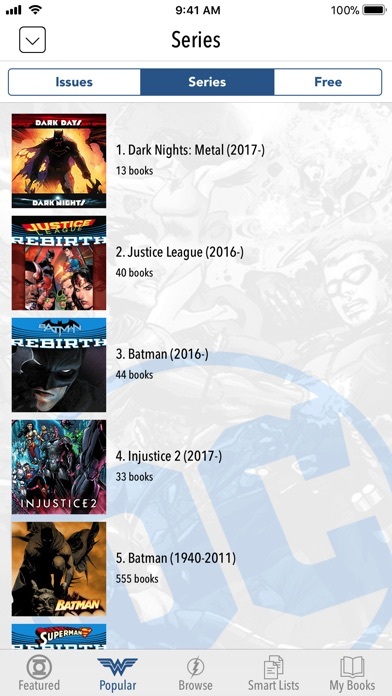 If you love DC comics you gotta love this app, it provides full detailed comics on the go without worrying about bending or ruining your actual books, plus the books are usually disounted since printing costs are gone. I recently found that infinite crisis and crisis on infinite earths is in here so It really has EVERYTHING you could ask for. EDIT: My review below is for a very old version. 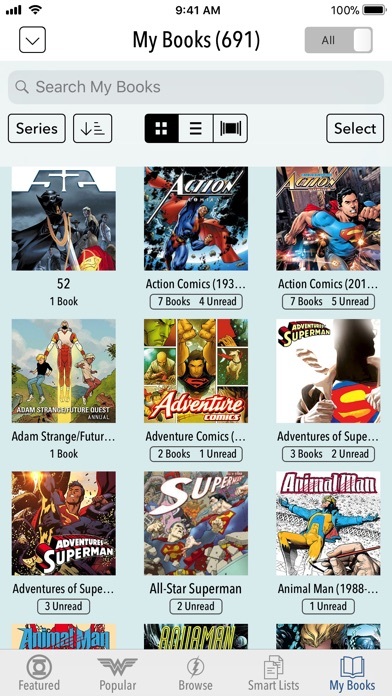 I've been using the regular ComiXology app since, and I've not tried the most updated version(s). --------------------- This app loses one star for frequent crashing. It loses a second star for offering the first issue of some older series (Like "52"), which succeed in getting me interested, but then not having the rest of the series available! Why bother teasing us with the first issue of a series (in some cases for free) if the rest (which have been published long ago) are not made available? That said, it is super-cool to be able to download these older series from my comfy chair at home. I'd love it if they made the trades available so you can get the whole series at once. Being a lifelong comic reader and collector, I love the D.C. App! Allows previews, knowing I can download the newest stories every Wednesday, and the ability to move comics on and off my device to control storage. Best way I can think of to get my weekly D.C. Comics! I can’t prove it, but in at least the issues I’ve purchased, DC seem to be applying a lossy compression scheme (think JPEG or similar) to the digital representations of their comics. This results in ugly compression artifacts that make reading an unpleasant experience. It's simply never acceptable to use lossy bitmap compression for text or hand-drawn color graphics - there are existing lossless algorithms that compress nearly as well and cause no drop in quality from the reference material. I have no doubt DC want the experience of reading a comic on an iPad to be just as good as reading on paper, and I'm optimistic they will make fixing this defect their utmost priority. Until that time however, I simply can't recommend this application. An App That's Both Super and Wonderful. 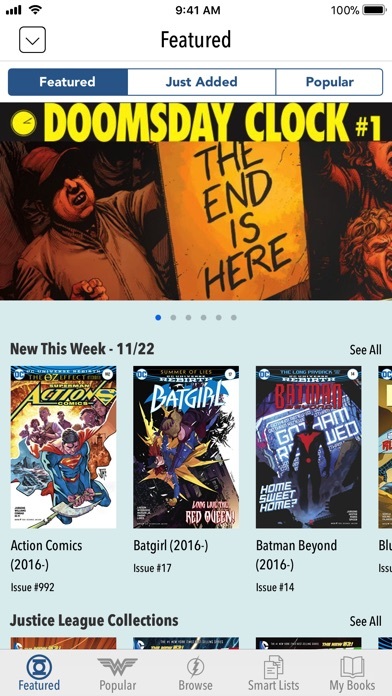 There's a lot to love about this app, and it's a must have for any DC fan that wants to do their reading digitally. It gets better with every update, and I love the amount of content that they have in their digital libraries. So useful. Who needs physical copies anyways? All right. Let me start by saying I've been a HUGE DC fan since 1973. I didn't even read my first Marvel until the 1980s. Even then DC was always number one in my heart. So as far as the content goes and the readability of the comics, I couldn't love this app more. I LOVE LOVE LOVE being able to see each panel much larger than it is on the printed page – it makes good art especially enjoyable! But I also have the marvel universe app and for about $70 a year I get thousands and thousands of comics. It's just an unbeatable value. As far as monetary value, the marvel app just blows DC out of the water! I have downloaded about 2000 DC comics, the vast majority of which cost $.99 each but a significant number were $5.99 or more. In the past three years I've spent about $2100 on DC Comics and $210 on Marvel comics. 10X more on DC. What? And what I've got to show for it is about 2000 DC comics at my fingertips and about 20,000 marvel comics at my fingertips. OK, if I accept that injustice as being the price I have to pay for being a DC fan, couldn't they at least mitigate the pain by offering a sale every week? Why doesn't DC Comics offer a sale on digital comics every single week???? It would cost them Jack squat and they would garnish some goodwill in addition to beaucoup bucks! Just a quick complaint that they only put Vertigo comics on sale maybe twice a year if you're lucky. Again, costs them nothing/beaucoup bucks. It’s serves its purpose and is very convenient. The interface can be a little wonky at time. Hopefully they keep updating. Great app! I need an iPad but still works great on my phone. I like buying whatever superhero comic catches my attention. Right now it's Titans and Superman. Can't ask for anything better. With a busy schedule, it's hard for me to get to a shop and spend time looking at books. This makes it much much easier to see what came out, download it, and go. Love this app!! The best way to stay connected to comics when you can't get the physical copy!! Easy to use!! I’m new to comics and I couldn’t be happier with this app!!! It’s really great and I recommend DC as a starting place if you’re looking for a new hobby. Can’t find the comics from the first volume up. They are all out of order.